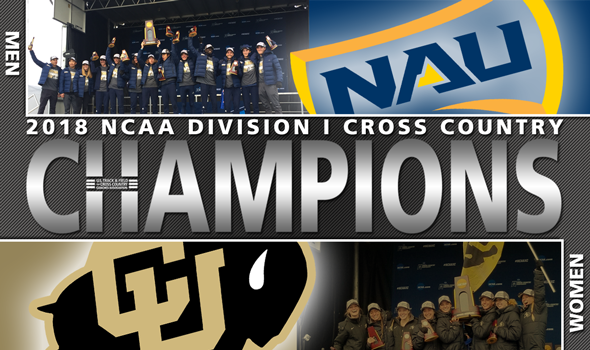 MADISON – The Northern Arizona men and the Colorado women are your 2018 NCAA Division I Cross Country National Champions after each team ran against strong fields on a snowy Thomas Zimmer Championship Course on Saturday. Each team handled its race in different ways. Colorado was able to run away with its team title as six of its athletes earned All-American honors. Northern Arizona found itself in a battle to the end but gutted out a strong group performance to walk away with its third straight national title. Wisconsin’s Morgan McDonald and Colorado’s Dani Jones took home the individual titles on the men’s and the women’s side. You can call it a dynasty. Top-ranked Northern Arizona won its third consecutive national championship while Wisconsin’s Morgan McDonald captured the individual crown at the 2018 NCAA Division I Men’s National Championships on Saturday. The Lumberjacks ended the meet with the No. 6, 15, 23, 26 and 29 placed finishers to post 83 points, a 33-point victory over the next closest team. Tyler Day, Matt Baxter, Luis Grijalva, Blaise Ferro and Peter Lomong all earned All-American honors. It is the first time a program has pulled off the three-peat sine Arkansas accomplished the feat during the 1998-2000 seasons. BYU (116 points), Portland (160), Colorado (178) and Stanford (201) all had strong performances to round out the top-five. BYU and Colorado had four All-Americans while Portland and Stanford each had three. McDonald won the individual title for the first time during his cross country career. He posted a time of 29:08.3 to lead the host Badgers to a seventh-place finish. It was the third victory for the senior this season as he also won the Big Ten Championships and the Nuttycombe Invitational. He was followed by Stanford’s Grant Fisher, Iowa State’s Edwin Kurgat, Oklahoma State’s Isai Rodriguez and Furman’s Aaron Templeton. Second-ranked Colorado, led by Dani Jones’ sensational run to the individual title, captured its first national championship since 2004 in dominant fashion. Jones kicked past New Mexico’s Weini Kelati on the final straightaway to give the Buffs the all-important low stick. The Colorado senior crossed the finish line in 19:42.5, nearly three full seconds ahead of Kelati, who appeared to all but break away from the field in the final 1K. Makena Morley, Tabor Scholl, Sage Hurta, Tayler Tuttle and Val Constien made sure Jones wouldn’t be the only Buffalo to earn All-America status as they finished eighth, 15th, 22nd, 24th and 30th overall, respectively. Tuttle, Colorado’s fifth runner, came through in 20:23.4 to give Mark Wetmore’s team a scant 41.4-second spread. The Buffs totaled 65 points, the fourth fewest since the women’s race changed from 5K to 6K in 2001. That gave Colorado a 38-point win over the runner-up Lady Lobos, who entered the meet ranked No. 1 in the final Women’s National Coaches’ Poll. Oregon finished a distant third with 160 points. Jessica Hull led the Ducks as she finished third overall in 19:50.4. Michigan rounded out the podium in fourth place, despite no runners in the top-20. The Wolverines did have two women earn All-America status: Camille Davre (29th place) and Avery Evenson (38thplace).